You use your phone to organize your life, so why not use it to organize the Spotify soundtracks to your life? The iPhone is particularly strong in this area, allowing you to rearrange tracks in a playlist and remove them if you need to declutter. Edit: Select this option to rearrange or remove tracks. If you tap Edit, you get a display with a warning sign on the left of each track and three horizontal lines on the right. To remove a track from the playlist, tap the warning symbol, and then select the Delete button that appears on the right. When finished, tap the Done button on the top-right of the screen. To rearrange a track, press and hold the horizontal lines and drag the track up or down into your desired position. When finished, tap Done. 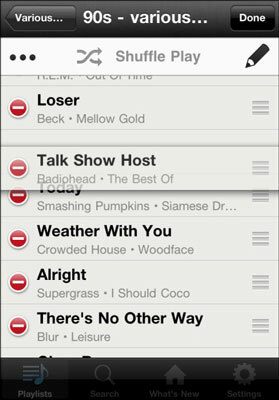 Share Playlist: You can share this playlist with your friends by tapping the rectangle symbol with the arrow coming out of it. You can copy the link, e-mail it, or share it to Facebook or Twitter. However, you can’t send playlists to your People list — only individual tracks. Make Collaborative: Select this option to make this playlist editable by anyone who has its link. It appears green in your playlist listings. Select the option again to make it non-collaborative. Tapping the pencil symbol brings you straight to the Edit screen, where you can rearrange or remove tracks. Your organizational options are more limited on Android than on the iPhone. You can remove and share tracks. You can’t rearrange tracks at this point. You can make a playlist collaborative by pressing and holding the playlist name, and then selecting Collaborative Playlist from the pop-up menu that appears.